To say that Pakistan is a gun-friendly country would be stating the obvious. The number of firearms owned by civilians here, both legal and otherwise, is estimated to be at least 18,000,000, which works out to a rate of 11.6 guns per 100 people. Compare that with India, where it is 3.36 per 100 people. No self-respecting ‘VIP’ — or an aspiring one — in Pakistan would deign to be seen without a posse of armed guards. Applications for arms licences have registered a steady increase with tens of thousands of them being issued within the span of a few years as the security situation has deteriorated. Shooting ranges are witnessing higher numbers of visitors. A small arms shooting competition in Karachi, the first ever international one, is scheduled for May. While such competitions are no doubt a healthy sporting activity — shooting is even an Olympic sport — it is rather disturbing that the forthcoming event includes a category for children. According to the organisers, children as young as 10 will be handling pistols and rifles on the occasion. After the APS Peshawar attack, Pakistan in some respects seems to have discarded clear thinking for knee-jerk reactionary responses. Students in several educational institutions in the country have been given weapons training by police and even taught to defuse bombs. To believe that such an approach can enhance students’ defence capabilities is surely deluded, and it could well have tragic consequences. It is for good reason that arms licences are not issued to those below the age of majority: with the right to handle lethal weapons comes the concomitant responsibility of due care that the law assumes is beyond the capacity of a minor. Even within the controlled environment of a shooting range, allowing children access to firearms conveys subliminal messaging that glorifies violence and renders the use of deadly force acceptable. Protecting children in a heavily militarised environment does not mean co-opting them into the dangerous pursuits that should be the domain of adults alone. Lax gun laws are the problem in Pakistan and there is no such distinction between sporting arms, handguns and assault weapons. Except for military personnel, not many civilians are familiarized with firearms safety. Most children who are introduced to firearms safety and their use under adult supervision, grow up as the most safest and responsible shooters. 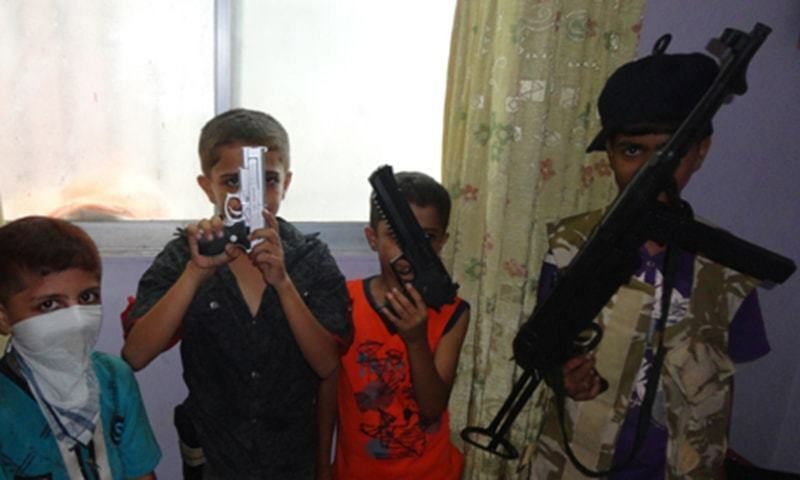 Don't confuse child soldiers with competition shooters. Pakistan really needs to rethink its many laws that compromise on public safety at every step from home to work. National Cadet Core - training used to be part of the education at college level both for girls and boys, 20-years back in Pakistan. For the reasons best known to the policy maker, it was discontinued. My personal experience of NCC lead me to say that it was the best part of my educational career, where we used to have the opportunity of exposing ourselves to military environment and it also used to give the students the confidence to handle any untoward situation and the morality to honor the rights of others. Indirectly, all the boys and girls used to have the opportunity to perfect their skills and talents regarding shooting related activities, at least the students used to able enough to properly hand a gun. Keeping in view the prevailing circumstances of Pakistan, I strongly recommend continuation of NCC program in the all the Public and private colleges in Pakistan. Guns can never be friends, all it knows to kill. It saves only when you are attacked. what are the chances that these students will be allowed to carry guns in school bag and they will start firing at the terrorists after they see them with guns and trying to barge into class rooms? Insane thinking. The chances are that having learnt how to use the weapons they would be settling their mutual disputes using secretly carried guns. It has happened many a times. @taimoor khan - Facing the world 'better' and facing it 'aggressively' are two different, rather opposite, concepts. The Talibans/ ISI and US Republicans have adopted the 'aggressive' approach. I hope we, as a nation, resist going down that path. The better approach is through education and progress. The best way to secure the children is to teach them how to avoid scuffles in order to prevent a major offense. Nevertheless our children should be given proper training for their self defense but weapon oriented training is not a good idea. The children should be trained in martial arts, karatey etc incorporated with the knowledge of peace building measures. 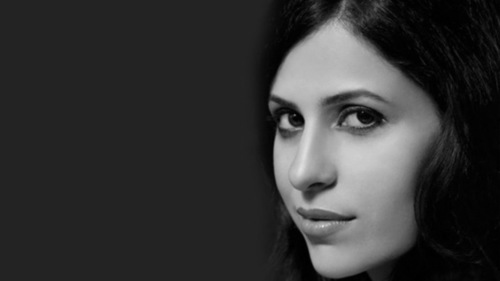 @taimoor khan What kind of world you want them to grow into? Children should be in schools, playing and learning. 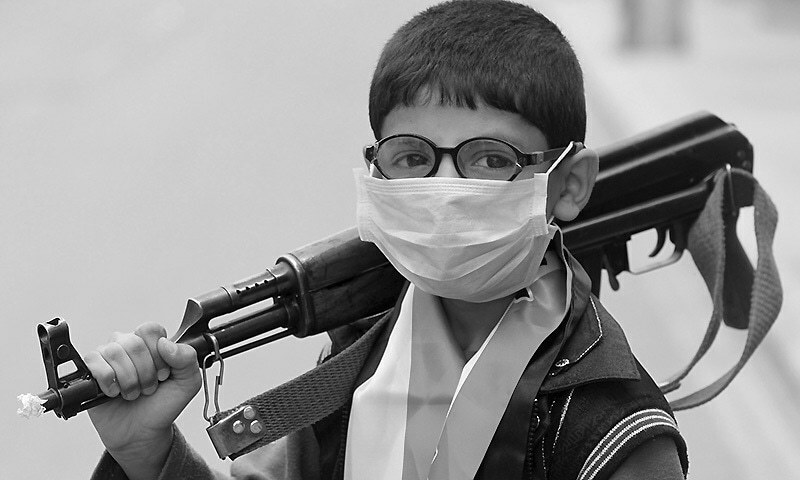 The thought of a child holding any kind of weapon is in my opinion deplorable! At least keep innocents away from guns. @taimoor khan BOOKS should be given to children at an early age, this will help them face the world better. Not guns. @Mian Shahid Mehmood Using guns in so-called safe or unsafe environment will have dangerous consequences most probably as guns are no friend to anyone. Take example of USA, people have guns rights but that did not give a safe environment there. So many innocent people get killed because of free movement of firearms. Look what is happening around the world mostly in Muslim countries, it's mostly because of guns. Look what happened in KP province in Pakistan, it is one of the beautiful places in the world and because of guns what happened to it's beauty. Just a thought. Its totally a wrong step taken by government to allow children to carry weapons for safety. In my opinion only the teachers should be allowed to carry weapons. Because one can expect any thing from a teenager carrying a gun. Bomb defusing training is ok but when it comes to guns its a total blunder. Don't like the idea even if it's for the personal defense after APS attacks. Those attacks were rare happening and we should not allow to expose our kids or next generation with fire and bullets, I hope and wish bad time is about to finish and these same kids need to take ink and pen as their tool to fight against the enemies of motherland. I wish them all the best, and to APS kids who lost their precious lives. We'll never forget you and your great sacrifices for out country you are martyrs and will remain so. Rest in peace. Not having a gun are already have tragic consequences. The terrorists are shooting these very children in the head. It's the responsibility of parents to manage kids, not of the state. And yes, there will be accidents and crazy kids abusing. That's the norm with anything in life. Are the rewards greater than the risk? The risk is never zero. Remember that there is a gun culture in KP and FATA. It is not easy to uproot. Look a USA, they haven't been able to diffuse gun culture. Nevertheless, children should never have access to guns unless under supervision. I agree. I learned gun safety and to fire a .22 caliber Springfield rifle at summer military school at the age of 10. At 11 I became a Red Cross certified Junior Life Guard at the same military school. Not only does safety come first, but the penalty for carelessness with firearms could be someone's accidental death. Keep guns away from children, give children pens, amrkers, crayons, books, notebooks, laptops, tablets instead! Give children a secure future. tech them ways of self defense since earlier classes. Now we can call our children gun handlers rather than educators. Next our children would be drug peddlers and what not. Standing by the gun you will die by the gun. Giving children a chance to participate in such events will make them conscious about firearm safety. There is a world of difference between participating in a shooting competition or learning firearm safety and owning a gun. 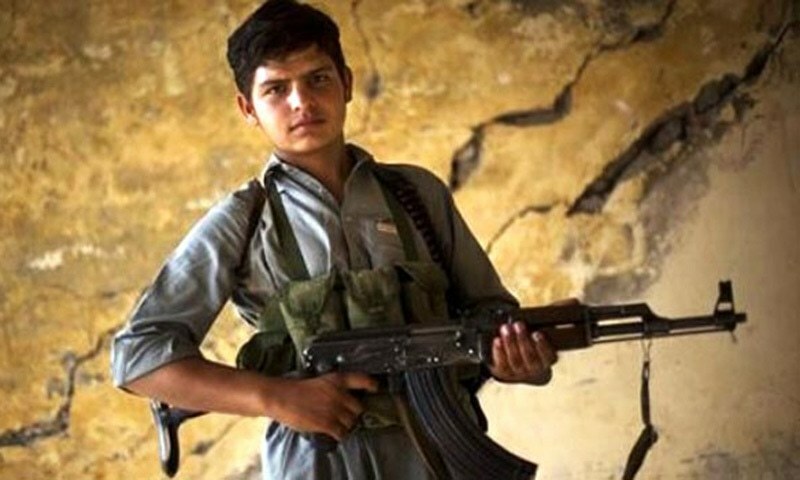 When Pakistani law doesn't allow anyone below 18 to own a gun, what is the fuss all about. If you want to keep children from having unsupervised access to guns, please campaign against illegal weapons. And who told you that children have been taught how to fire. 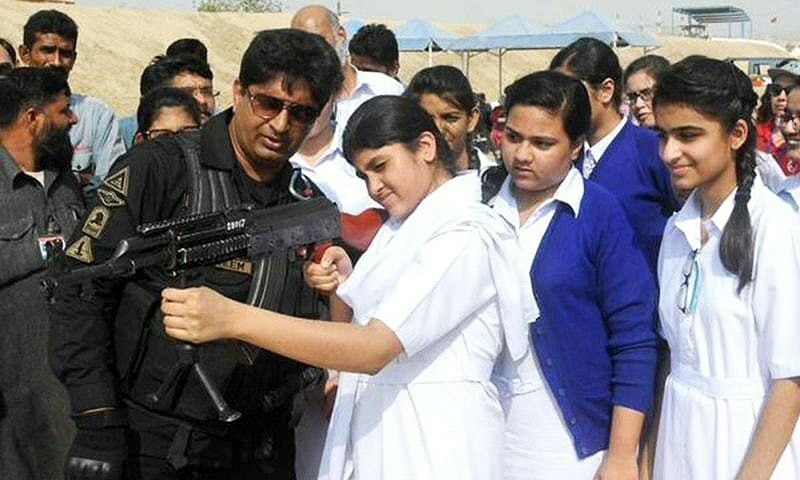 The police instructor shown in the picture above himself said on TV that one can't learn to shoot by firing one or two shots and the purpose of this exercise was to reduce the fear associated with the sight of a gun and sound of gunfire, so the children don't lose their senses if any such incident happens. Coming to what you wrote in the start of the editorial, Pakistan is not a legal-gun friendly nation, thanks to the stupid gun laws. And the people in India aren't happy with their gun laws either.